As some of you might know about a month ago we took a family vacation and road tripped to Souther California. I have got a lot of questions on how we traveled with two under two, especially with a newborn. I thought I would share some traveling essentials and a few things that we couldn't live without. All of these items (but the fan) can be found at babycubby.com, and that is why I love it so much. It is a one stop shop not just any baby products but for the best baby products. They research and sell the best of the best! Being a parent can be so hard sometimes and it is nice to know that Baby Cubby has already researched the items you are buying and make you confident in your decision. They aren't just any baby store, they are a resource for parents and I know that I need all the resources I can get in this journey as a mom. Stroller - It is important to bring a stroller that is not only accommodating to your little one but also one that doesn't take up a ton of space. The City Tour Lightweight Jogger literally folds up smaller and easier than any stroller I have ever seen. This would be perfect for a road trip or if you have a smaller car (like me). My favorite part about this stroller is that it can fold up and be carried in a travel back pack. I am all about having free hands to take care of my babies and having a stroller that takes up less space. 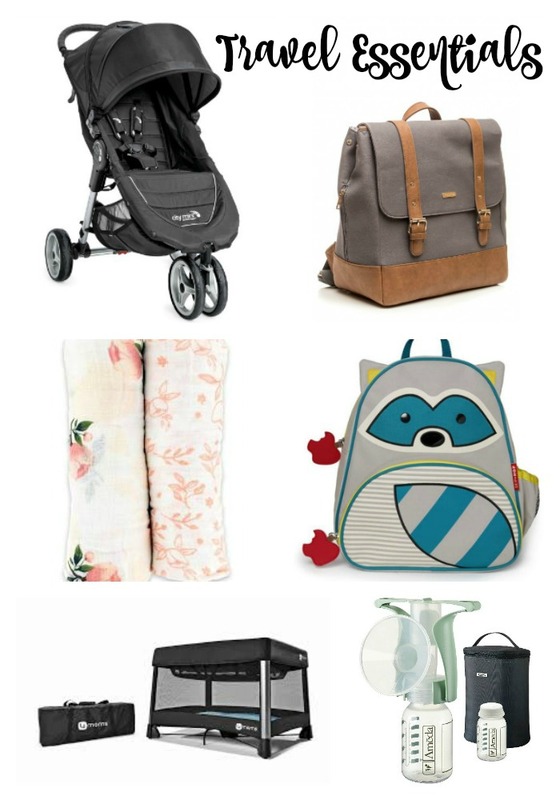 Backpack - I would recommend a backpack style diaper bag to anyone with kids, especially an active toddler. The Little Unicorn Marindale backpack diaper bag is cute and functional which is perfect for travel. Muslin Swaddle - Often times I use a swaddle blanket as a nursing cover too. The Little Unicorn Muslin Swaddles are huge! I just tie the swaddle around my neck and it covers me while nursing and keeps the baby cool which is important when you are in the heat too. I can't stand nursing when I am sweating, it stresses me out! Ha ha please tell me I am not the only one. Also, Henley has to be swaddled most the time so I always have a swaddle with her as well as an extra one in the diaper bag. This makes the swaddles have more than one use and saves space for travel. Toys & Snacks - Krew loves having his own little backpack with toys and snacks to carry around. This cute backpack is perfect for him. I like to let him pick some of his favorite toys and snacks to put in his backpack. Then I will add some surprises in there from the dollar store and that makes traveling fun and exciting for him. Small Pump - Since Henley is exclusively nursed and I produce so much milk, sometimes after nursing I still feel like I need to pump a little. I know everyone says that will make you produce more but I never pump more than and ounce or two out of each side just for relief especially since I get mastitis so easily. Also, she sleeps 7 hours at night so especially in the morning I pump after I feed her. I love this pump because it is small, easy to clean and easy to pack. I would highly recommend something like this for moms who nurse and have the same problem (it is better than having a low milk supply so I am not complaining at all) as me. 4moms Breeze Playard - When we were in Vegas on our way down we stayed in hotels. I know that some hotels let you rent them for like $20 a night and when we were in California we stayed in a condo and we weren't sure if there was one there, so we just brought ours. These are a necessity for every parent, especially if you have little ones. Fan - This seriously saved our lives more time than once. When we were in California we spent most our time on the beach, in the hot sun and a full day at Lego Land. You guys it was HOT. I got this fan and would just sit it in the top of the carseat and put a blanket over the front of it and it was like an air conditioned room. We also put it in our tent and used it to blow cold air on Krew when he was napping at the beach.